Please refer to our stock # de2 when inquiring. This spectacular pin was made by the firm of Delizza and Elster, better known as the makers of "Juliana". 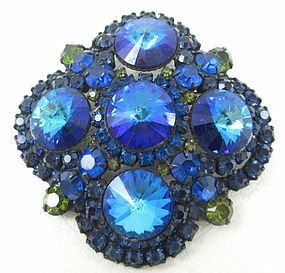 The pin is 2 1/2" x 2 1/2" and is set with 5 large fancy rivoli Montana blue stones. It has a Japanned setting with chartreuse and sapphire stones surrounding the larger rivolis. The rivoli stones have small nicks on the pointed end, but it is not noticeable when worn.